WARNING: This medication may rarely cause tendon damage (such as tendonitis, tendon rupture) during or after treatment. Your risk for tendon problems is greater if you are over 60 years of age, if you are taking corticosteroids (such as prednisone), or if you have a kidney, heart, or lung transplant. Stop exercising, rest, and get medical help right away if you develop joint/muscle/tendon pain or swelling. Ciprofloxacin should not be used by patients with myasthenia gravis. It may cause the condition to become worse. Get medical help right away if you develop muscle weakness or trouble breathing. USES: This medication is used to treat a variety of bacterial infections. 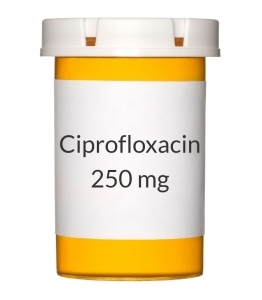 Ciprofloxacin belongs to a class of drugs called quinolone antibiotics. It works by stopping the growth of bacteria. This antibiotic treats only bacterial infections. It will not work for virus infections (such as common cold, flu). Unnecessary use or misuse of any antibiotic can lead to its decreased effectiveness. HOW TO USE: Read the Medication Guide and, if available, the Patient Information Leaflet provided by your pharmacist before you start taking ciprofloxacin and each time you get a refill. If you have any questions, ask your doctor or pharmacist. Take this medication by mouth with or without food as directed by your doctor, usually twice a day in the morning and evening. The manufacturer directs not to split/chew/crush the tablet before taking it. However, many similar drugs (immediate-release tablets) can be split/chewed/crushed. Follow your doctor's directions on how to take this medication. The dosage and length of treatment is based on your medical condition and response to treatment. Drink plenty of fluids while taking this medication unless your doctor tells you otherwise. Take this medication at least 2 hours before or 6 hours after taking other products that may bind to it, decreasing its effectiveness. Ask your pharmacist about the other products you take. Some examples include: quinapril, vitamins/minerals (including iron and zinc supplements), and products containing magnesium, aluminum, or calcium (such as antacids, didanosine solution, calcium supplements). Calcium-rich foods, including dairy products (such as milk, yogurt) or calcium-enriched juice, can also decrease the effect of this medication. Take this medication at least 2 hours before or 6 hours after eating calcium-rich foods, unless you are eating these foods as part of a larger meal that contains other (non-calcium-rich) foods. These other foods decrease the calcium binding effect. Ask your doctor or pharmacist about safely using nutritional supplements/replacements with this medication. Antibiotics work best when the amount of medicine in your body is kept at a constant level. Therefore, take this drug at evenly spaced intervals. Continue to take this medication until the full prescribed amount is finished, even if symptoms disappear after a few days. Stopping the medication too early may result in a return of the infection. Tell your doctor if your condition persists or worsens. SIDE EFFECTS: See also Warning section. Nausea, diarrhea, dizziness, lightheadedness, headache, and trouble sleeping may occur. If any of these effects persist or worsen, tell your doctor or pharmacist promptly. Remember that your doctor has prescribed this medication because he or she has judged that the benefit to you is greater than the risk of side effects. Many people using this medication do not have serious side effects. Ciprofloxacin may rarely cause serious nerve problems that may be reversible if identified and treated early. Get medical help right away if you develop any of the following symptoms: pain/numbness/burning/tingling/weakness in any part of the body, changes in how you sense touch/pain/temperature/body position/vibration. Tell your doctor right away if you have any serious side effects, including: skin that sunburns more easily (sun sensitivity), unusual bruising/bleeding, signs of a new infection (such as new/persistent fever, persistent sore throat), unusual change in the amount of urine, change in color of urine (red/pink urine), signs of liver problems (such as unusual tiredness, stomach/abdominal pain, persistent nausea/vomiting, yellowing eyes/skin, dark urine). Get medical help right away if you have any very serious side effects, including: severe/persistent headache, vision changes, shaking (tremors), seizures, severe dizziness, fainting, fast/irregular heartbeat, mental/mood changes (such as anxiety, confusion, hallucinations, depression, rare thoughts of suicide). This medication may rarely cause a severe intestinal condition (Clostridium difficile-associated diarrhea) due to a type of resistant bacteria. This condition may occur during treatment or weeks to months after treatment has stopped. Tell your doctor right away if you develop: persistent diarrhea, abdominal or stomach pain/cramping, blood/mucus in your stool. Do not use anti-diarrhea products or narcotic pain medications if you have any of these symptoms because these products may make them worse. Use of this medication for prolonged or repeated periods may result in oral thrush or a new yeast infection. Contact your doctor if you notice white patches in your mouth, a change in vaginal discharge, or other new symptoms. A very serious allergic reaction to this drug is rare. However, get medical help right away if you notice any symptoms of a serious allergic reaction, including: rash, itching/swelling (especially of the face/tongue/throat), severe dizziness, trouble breathing. This is not a complete list of possible side effects. If you notice other effects not listed above, contact your doctor or pharmacist. In the US - Call your doctor for medical advice about side effects. You may report side effects to FDA at 1-800-FDA-1088. In Canada - Call your doctor for medical advice about side effects. You may report side effects to Health Canada at 1-866-234-2345. PRECAUTIONS: Before taking ciprofloxacin, tell your doctor or pharmacist if you are allergic to it; or to other quinolone antibiotics such as norfloxacin, gemifloxacin, levofloxacin, moxifloxacin, or ofloxacin; or if you have any other allergies. This product may contain inactive ingredients, which can cause allergic reactions or other problems. Talk to your pharmacist for more details. Before using this medication, tell your doctor or pharmacist your medical history, especially of: diabetes, heart problems (such as recent heart attack), joint/tendon problems (such as tendonitis, bursitis), kidney disease, liver disease, myasthenia gravis, nervous system disorders (such as peripheral neuropathy), conditions that increase your risk of seizures (such as brain/head injury, brain tumors, cerebral atherosclerosis). Ciprofloxacin may cause a condition that affects the heart rhythm (QT prolongation). QT prolongation can infrequently result in serious (rarely fatal) fast/irregular heartbeat and other symptoms (such as severe dizziness, fainting) that need medical attention right away. The risk of QT prolongation may be increased if you have certain medical conditions or are taking other drugs that may cause QT prolongation. Before using ciprofloxacin, tell your doctor or pharmacist of all the drugs you take and if you have any of the following conditions: certain heart problems (heart failure, slow heartbeat, QT prolongation in the EKG), family history of certain heart problems (QT prolongation in the EKG, sudden cardiac death). Low levels of potassium or magnesium in the blood may also increase your risk of QT prolongation. This risk may increase if you use certain drugs (such as diuretics/"water pills") or if you have conditions such as severe sweating, diarrhea, or vomiting. Talk to your doctor about using ciprofloxacin safely. This medication may rarely cause serious changes in blood sugar levels, especially if you have diabetes. Watch for symptoms of high blood sugar including increased thirst and urination. Ciprofloxacin may increase the blood sugar-lowering effects of the medication glyburide. Also watch for symptoms of low blood sugar such as sudden sweating, shaking, fast heartbeat, hunger, blurred vision, dizziness, or tingling hands/feet. Check your blood sugar regularly as directed by your doctor and report any changes. If you experience symptoms of low blood sugar, you may raise your blood sugar by using glucose tablets/gel or eating a quick source of sugar such as table sugar, honey, or candy, or drinking fruit juice or non-diet soda. Tell your doctor immediately about the reaction and the use of this product. To help prevent low blood sugar, eat meals on a regular schedule, and do not skip meals. Your doctor may need to switch you to another antibiotic or adjust your diabetes medications if any reaction occurs. This drug may make you dizzy. Do not drive, use machinery, or do any activity that requires alertness until you are sure you can perform such activities safely. Limit alcoholic beverages. This medication may make you more sensitive to the sun. Avoid prolonged sun exposure, tanning booths, and sunlamps. Use a sunscreen and wear protective clothing when outdoors. Other medications (such as tretinoin-mequinol) may increase your sun sensitivity. Ask your doctor or pharmacist for more details. Ciprofloxacin may cause live bacterial vaccines (such as typhoid vaccine) not to work as well. Therefore, do not have any immunizations/vaccinations while using this medication without the consent of your doctor. Before having surgery, tell your doctor or dentist about all the products you use (including prescription drugs, nonprescription drugs, and herbal products). Children may be more sensitive to the side effects of this drug, especially joint/tendon problems. Older adults may be more sensitive to the side effects of this drug, especially tendon problems (especially if they are also taking corticosteroids such as prednisone or hydrocortisone) or heart problems. During pregnancy, this medication should be used only when clearly needed. Discuss the risks and benefits with your doctor. This medication passes into breast milk. Consult your doctor before breast-feeding. DRUG INTERACTIONS: See also How to Use and Precautions sections. Drug interactions may change how your medications work or increase your risk for serious side effects. This document does not contain all possible drug interactions. Keep a list of all the products you use (including prescription/nonprescription drugs and herbal products) and share it with your doctor and pharmacist. Do not start, stop, or change the dosage of any medicines without your doctor's approval. Some products that may interact with this drug include: "blood thinners" (such as acenocoumarol, warfarin), strontium. Many drugs besides ciprofloxacin may affect the heart rhythm (QT prolongation), including amiodarone, dofetilide, quinidine, procainamide, sotalol, among others. This medication can slow down the removal of other medications from your body, which may affect how they work. Examples of affected drugs include duloxetine, tizanidine, among others. Avoid drinking large amounts of beverages containing caffeine (coffee, tea, colas), eating large amounts of chocolate, or taking over-the-counter products that contain caffeine. This drug may increase and/or prolong the effects of caffeine. Although most antibiotics probably do not affect hormonal birth control such as pills, patch, or ring, some antibiotics may decrease their effectiveness. This could cause pregnancy. Examples include rifamycins such as rifampin or rifabutin. Be sure to ask your doctor or pharmacist if you should use additional reliable birth control methods while using this antibiotic. NOTES: Do not share this medication with others. This medication has been prescribed for your current condition only. Do not use it later for another infection unless your doctor directs you to do so. A different medication may be necessary in that case. Laboratory and/or medical tests (such as kidney function, blood counts, cultures) should be performed periodically to monitor your progress or to check for side effects. Consult your doctor for more details. Do not change brands of this medication without checking with your doctor or pharmacist. Not all brands have the same effects.